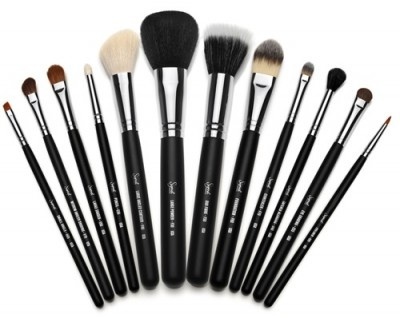 Makeup brushes are made of two fibers; you have natural and synthetic to choose from. Generally synthetic brushes, through my experience, are cheaper and courser. They appear stiffer to the eye and provide poorer application in the end. In contrast, natural bristle brushes are of higher quality and appear softer but are on the pricier side. If you’re willing to pay more upfront, natural brushes are the way to go. They give you that flawless buffed air-finished look we all so desire and as long as you take care of them, they could potentially be your firsts and lasts. If you take care of them, they’ll take care of you too! If you’re a poor college student like myself, I suggest purchasing the most vital brushes at first and slowly add to your collection. If you find a great foundation brush it’ll make applying the rest of your makeup that much easier. It’s okay to experiment with different brands. One brand that someone may absolutely adore may not work as well for you or for your skin. Some women swear by MAC brushes, and most of my brushes in my collection are MAC, but I love my Smashbox brush too. Though using brushes that are soft and carefully made is important, you must know how to appropriately treat your brushes. Storing, frequently washing, and reshaping them are vital to extending their life. Choosing a form of storage for your brushes is always a fun and exciting task. Some popular solutions include makeup brush rolls, caboodles with elastic bands or pockets, organizing drawers, and vases with beads or stones, etc. The storage solution you pick needs to be practical to your lifestyle and the amount of space you have available to work with. If your frequently traveling or on the move, brush specific makeup bags or containers will become your best friends. If you have a good amount of counter space and you want to exhibit your beauty products and brushes in a feminine but contemporary way, I highly suggest looking into cute Do-It-Yourself projects online to find something that matches your bedroom/ bathroom decor. ALWAYS be sure your storage doesn’t misshape your brushes. Bristles can be permanently bent and separated causing caking and streaking of makeup. I currently use MAC’s pink makeup brush cleanser. In the past I would swirl my brushes in this solution in a small container or in my hand. I had to do this multiple times for a single brush; rinsing, repeating, etc. I would run through brush cleanser almost like it was water. Since then, I’ve invested in a mini spray bottle. I can’t begin to explain how amazing it is to have the time it takes to wash my brushes be cut in half! I spritz my brushes a few times, separating the fibers, let the solution seep into the bristles, and dab back and forth on a couple paper towels. I repeat these steps until no pigmentation appears on my towels. Once you’ve cleaned your brushes, be sure you take the time to reshape them. No one wants to spend close to hundreds of dollars on high end brushes and they become scraggly because they haven’t been treated properly. I find I have to bathe my liquid foundation brush the most frequently, while my concealer brush comes in second. I love my MAC’s brushes. They seem to fall apart a lot less than other brand, and they aren’t thin.